You searched for: Category Politics and government Remove constraint Category: Politics and government Category Economics Remove constraint Category: Economics Subject Indigenous peoples--Legal status, laws, etc. Remove constraint Subject: Indigenous peoples--Legal status, laws, etc. Taller: Participación y Justicia. 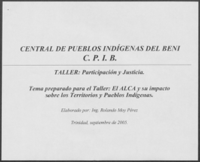 Tema preparado para el Taller: El ALCA y su impacto sobre los territorios y pueblos indígenas.